A range of personal, social, economic, and environmental factors contribute to individual and population health. For example, people with a quality education tend to be healthier throughout their lives. 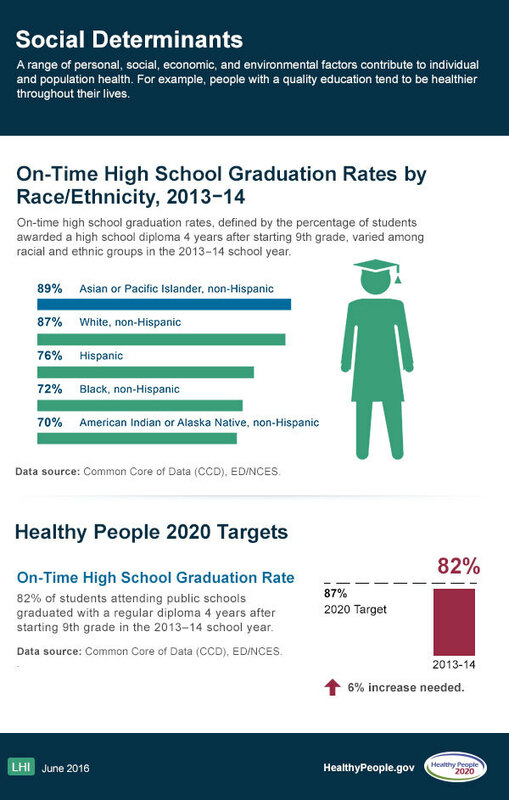 On-time high school graduation rates, defined by the percentage of students awarded a high school diploma 4 years after starting 9th grade, varied among racial and ethnic groups in the 2013–14 school year. Data source: Common Core of Data (CCD), ED/NCES. 82% of students attending public schools graduated with a regular diploma 4 years after starting 9th grade in the 2013–14 school year.